When it comes to exploring a new place trekking is one of my favourite ways to do it. There are few things that I enjoy more than getting outside and challenging myself to do a new trail or to reach the summit of a new peak. That might sound quite daunting if trekking is something new to you which is why we have put together our top tips for trekking and hiking. 1. Make sure you are in good shape before you go – now I don’t mean that you have to be ready to run a marathon or compete in the Olympics but you do need a reasonable level of fitness if you are going to be walking for several hours a day. If you are going on a multi-day expedition make sure that you have a training plan and that you get in a number of training walks before you go. 2. SHOES! – this is in capitals with an exclamation mark for a reason. I could go on all day about why having a good pair of shoes or boots is essential when you are trekking. I will spare you that, but they are necessary firstly for your comfort. You want to make sure that you don’t get blisters from your boots and that you find them really comfortable even after a long day. You also want to check that they are appropriate for the conditions. In some places it will be imperative that you have waterproof boots, in others good ankle support might be key. Finally make sure that you break your boots in really well and that you wear them on all your training walks. 3. Water and snacks – obviously this is vital when you are taking part in a long hike, but really it is important regardless of how long you are planning to be out. You never know what might happen and you will be thankful that you have adequate water and food should you need it. It is good to carry some high energy things like trail mix just in case but also to give you a boost when you start to feel tired. 4. Layers – Make sure that you have layers so that you are prepared if the weather changes. If you are planning to trek at altitude the weather can change very quickly and you will want to have appropriate clothing if it does. This might mean packing a raincoat in your day bag when the sun is shining as you set off. 5. Allow plenty of time – take it from someone who has learnt this the hard way it is better to allow yourself extra time rather than be rushing to get where you need to be before dark. This might mean dragging yourself out of bed a little earlier but you will be thankful that you did if you find the trek is more strenuous than you anticipated or if you take a wrong turn. And if everything goes to plan you will have more time for photos, enjoying the scenery and relaxing when you reach your destination. 6. Take a map or go with a guide – going hiking or trekking with a guide is probably the best way to ensure that you stay safe and that you don’t get lost, in fact in some places it is the only way to see an area. If you do decide to go it alone then make sure that you have a map and compass and that you know how to use them. 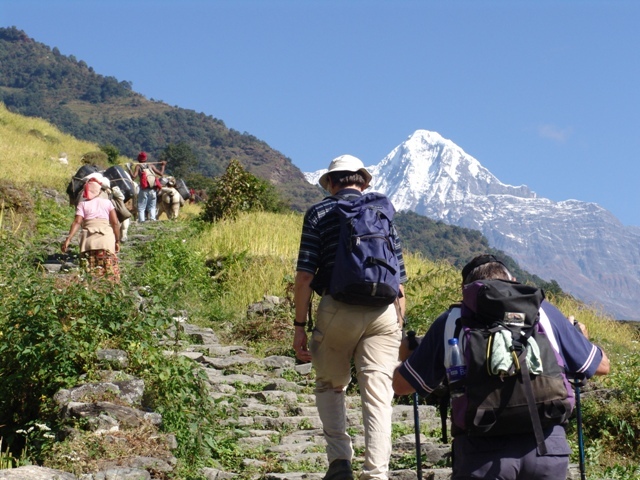 If you are now keen to get out and enjoy the great outdoors why not think about joining in one of our treks in Nepal.